My plan for this section was to visit restaurants in our various regions over the course of the year, and then write about those experiences. For the spring issue, I chose the West Michigan area, Grand Rapids specifically. There was a happy coincidence of events, so choosing Grand Rapids was easy. One of my favorite things, Cirque du Soleil, was going to be in town. Tickets were purchased, and our plans started to come together. I spoke with our West MI sales rep, Kay, to get some recommendations, and after checking a few places online decided to dine at Bistro Bella Vita. I love to try new restaurants, and though Bistro Bella Vita is not new (it opened in 1997), it is new to me. 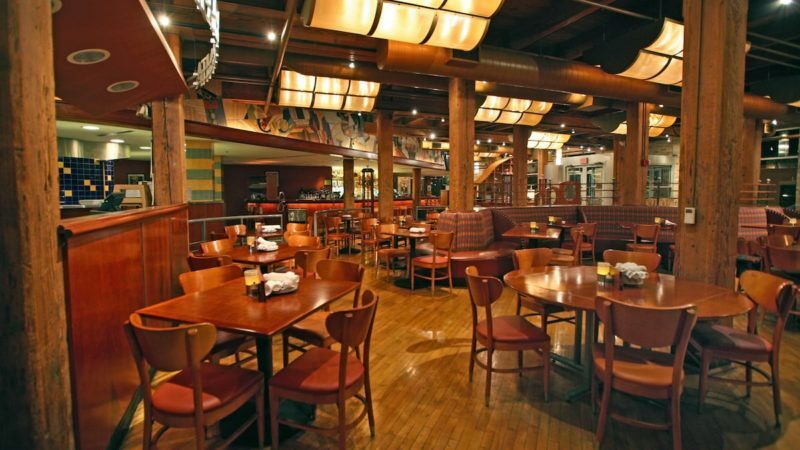 Owned by the Essence Restaurant Group, this location is convenient to the Van Andel Arena, which was crucial, as we wanted to park and walk to both. According to the website, the restaurant is “designed to ensure guests understand their top priorities: Cuisine, beverage, and service, with a layout that features and accents cuisine preparation and their commitment to high-quality beverage service…serving Mediterranean country cuisine made fresh daily.” In researching the restaurant, I learned that they have been serving farm-to-plate for almost 20 years, supporting sustainable farming long before it was the”in” thing to do – they even grow their own produce. The restaurant also makes it a point to recycle all of its kitchen waste. Walking into the restaurant, we were greeted warmly, and the atmosphere was comfortable. Think lots of wood, chrome, and stainless steel. We were quickly shown to our seats, and we settled in. Half of our group hadn’t yet arrived, so we ordered an appetizer to nibble on while we waited. Our waitress, Patria, was helpful, informative, and very friendly. Our appetizer, white and garbanzo bean hummus, arrived promptly, and we dug in. It was served with flatbread and lightly pickled vegetables and was very flavorful – lots of garlic, which I love. Patria was patient as we waited for the rest of our party. She kept our water glasses full and served me a lovely glass of Tempranillo; we never felt rushed or forgotten. When the rest of our group arrived, we ordered – Parisian Gnocchi, Bucatini Carbonara, Rotisserie Roasted Amish Chicken, and the Pork Two Ways. Without going into the specifics of the dishes, let me just say that the gnocchi and the pork chop that was served were the best any of us had ever tasted. The other dishes were really good, too, but these two dishes were outstanding. The pork chop was cut thick and perfectly cooked. The gnocchi was the lightest I’ve ever tasted. There were no leftovers at our table! We ordered three desserts (the Tre Dolce option) because we all wanted to sample a little of a few desserts; the Brown Butter Brioche Bread Pudding, the Crème Brulee, and the Warm Flourless Chocolate Cake. Yum. All were good, and the dessert plates were clean. The restaurant was busy because of the show, so the volume was a little high. I enjoy the din of people, but another in our party thought it was too loud. That was the only complaint from our group. We spent a wonderful two hours at Bistro Bella Vita, and I will most definitely eat there again.